I’ve been studying Ayurveda and Ayurvedic Rituals for the past few months, so it was only natural that during my time in India – the land of Ayurveda itself – I would do more research and look into ways of practicing it in my day to day life. I was introduced to the healing and metaphysical benefits of drinking water from a copper vessel. Like so many things in life, the timing was perfectly aligned as I had recently purchased a gorgeous copper vessel – as a part of my love for rose gold – I knew it was coming home with me to London. 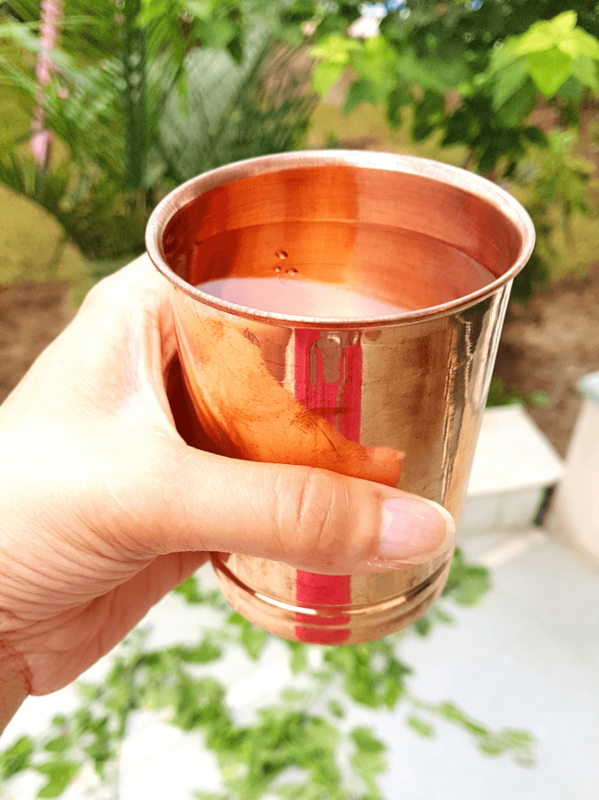 Drinking from a copper vessel, Tamra jal, is an ancient Ayurvedic practice. Before we had so many fancy water filters, people used copper for its antibacterial and antiviral properties. In Sanskrit tamara translates as copper and jalwater. Tamra jal balances all three doshas and is typically consumed by yogis first thing in the morning as part of their daily meditation practice. Tamra jal has a host of health benefits including boosting immunity, conducting spiritual energy, and reducing inflammation in the body. Fill the copper cups with water. Cover with a light cloth and let sit on the counter for a minimum of 8 hours (the reason why water is stored for so long is the fact that copper takes time to leach into water. It lends water all its beneficial properties.) Remove the cloth and drink at least one cup first thing in the morning. Have you tried copper water? I’d love to hear your thoughts.